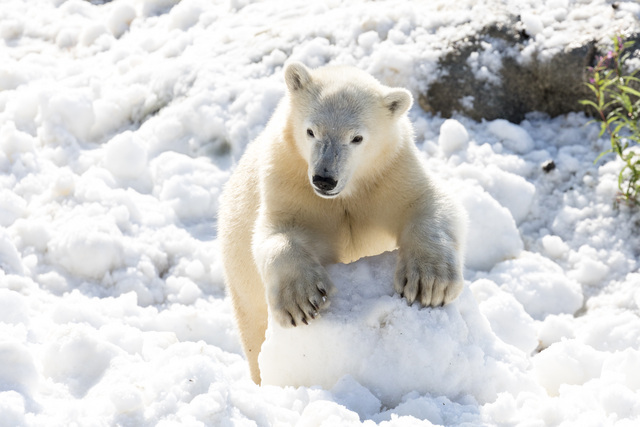 Nalle wondered if it had been snowing AGAIN! Terve taas! Hello again! Oh bear, you can’t imagine what a great surprise mama and I had this morning! 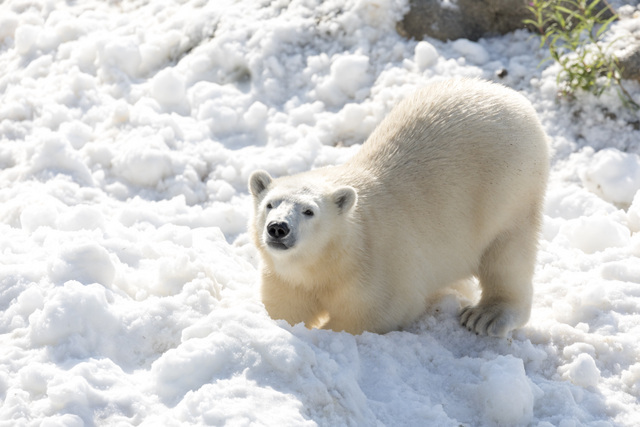 When we came out we found lots of snow in our enclosure! First we thought it’s been snowing again but then we found out that the snow is a donation from the Ruka Ski Resort. Ruka has so much snow stored for the next season that they decided to bring some of it to us. The idea came from the children of an employee in Ruka. 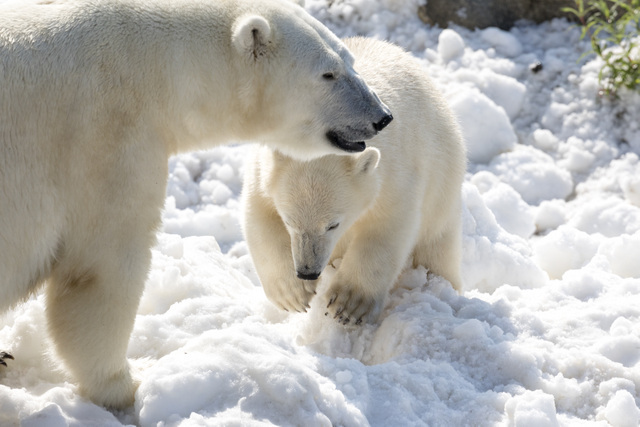 When they visited the Ranua Zoo the children wondered why there was no snow for the polar bears. Well, it could easily be arranged their father thought and today we could enjoy the touch of snow under our paws again! We’ve had some really hot days so the timing was perfect!! Let’s see if I remember what to do with this white stuff! There’s so much snow that I can make a small cave, too! 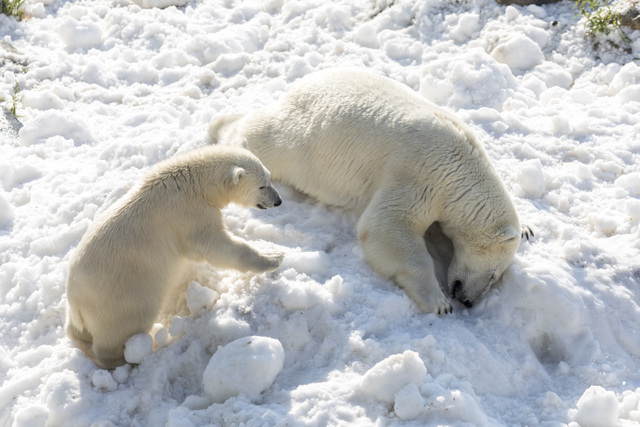 Hahaa, the visitors must be wondering where the cute polar bear boy is …..
Oh bear, mama found me – but she’s a very clever and observant mama. Too observant sometimes if yo ask me! Thank you, Ruka, for bringing us this wonderful gift! Mama said that seeing snow is like meeting a dear friend again. She certainly looks happy! Of course, even my papa Manasse got his fair share of the snow. He’s already an elderly gentlebear so he just took a short nap on a snow heap instead of rolling in it. However, I’m sure he’ll be rolling in the snow in the afternoon when it gets really hot. I’m a happy polar bear boy today. 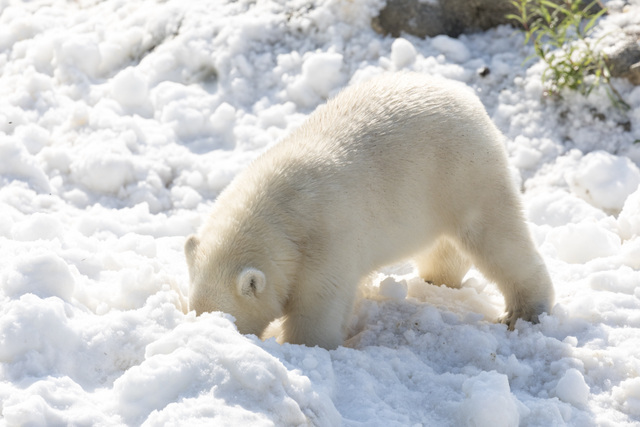 On second thought – I’m a happy polar bear boy every day! 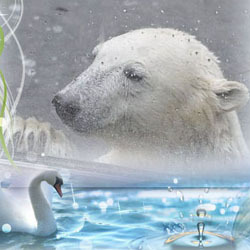 Dear readers, I hope somebody will donate snow to you, too, when and if it gets too hot! So eine Ladung Schnee mitten im Sommer ist natürlich eine feine Sache. Na da ist ja eine tolle Überraschung für den kleinen “Nalle” und seiner Mama Venus. Schnee im Sommer! Einfach herrlich. Die beiden haben jedenfalls viel Spaß. Leider wird die weiße Pracht sehr schnell schmelzen. Danke liebe Mervi für`s Einstellen. Danke auch an Marko für die wunderschönen Bilder. 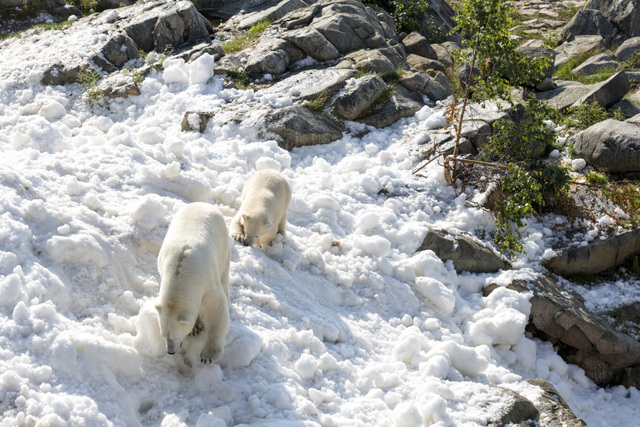 the polar bears in Ranua got a big surprise.It was a great idea to bring the the snow from the Ruka Ski Resort. Venus likes the snow 🙂 Nalle was happy to play in the snow. When I saw the pics without reading the subtitles I was shocked… Oh no, it´s winter again in Ranua after an extreme short spring and no summer at all I thought. Fortunately it IS summer even in Ranua. 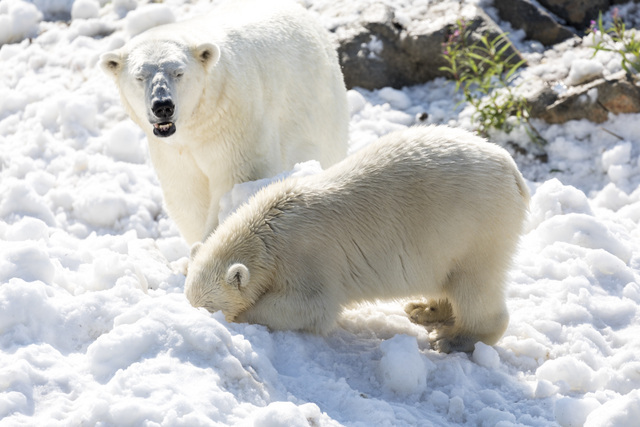 The polar bears Venus, Nalle and Manasse just got a wonderful surprise with a big heap of snow. 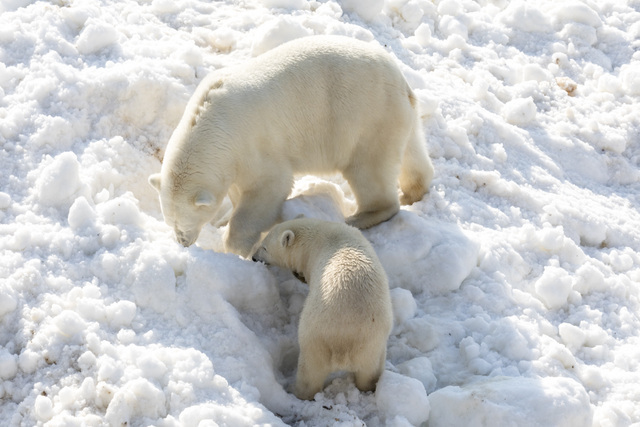 What a nice and refreshing idea from some kids who love polar bears and how generous from the Ruka Ski Resort! I´m happy for the bears, they obviously have so much fun. The pics are marvellous – as always. Thank you for these heartwarming impressions! Liebe Nalle, Marko und Mervi! Schöne Ueberraschung. Bitte merken sie wie GROSSE TATZEN NALLE HAT! Nalle will sicher grösser als Papa manasse werden. das ist ja wirklich eine perfekte Überraschung. Ich wundere mich gar nicht darüber, dass die Idee, euch Schnee zu schenken, von Kindern stammt. Wie schön, dass das Ruka Ski Resort diese zauberhafte Idee in die Tat umgesetzt hat. Die Fotos von Marko Junttila sind wunderbar und mit deiner Hilfe hat Mervi die Geschichte vom Schnee im Juli sehr schön aufgeschrieben. Ich wünsche dir, deiner Mama und deinem Papa noch viel Spaß mit dem Schnee. Vielleicht rollst du ja noch einen oder zwei große Schneebälle und deine Mama baut einen Schneemann daraus. Oh, wonderful to see this ‘TERVE TAAS’ which means we are again spoiled with gorgeous VENUS-, NEALLE- and MANASSE pictures as well as pics of other species in the beautiful f i n n i s h(!) ‘RANUA WILDLIFE PARK’. 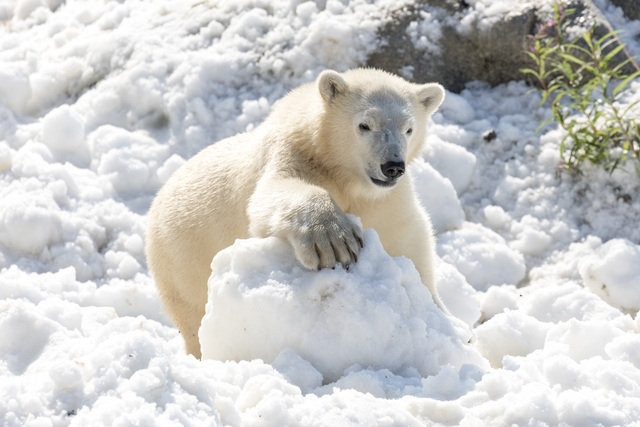 Dear NALLE, you won’t believe it, I am not at all astonished to learn from your report that you found again SNOW in your enclosure – in JULY! In , may be it’s due to the ‘Kour region of Europe it’s SAID to be HIGH(!) SUMMER and we ahve mainly around 20° Celsius, lots of rain, and it’s as dark as in winter . . . (earlier temperatures around 33 to 37° Celsius were rather ‘normal’ at this time of the year . . . May be, it’s just one cool summer (pity! ), may be it’s due to the ‘KLIMAWANDEL’ (tragedy!). 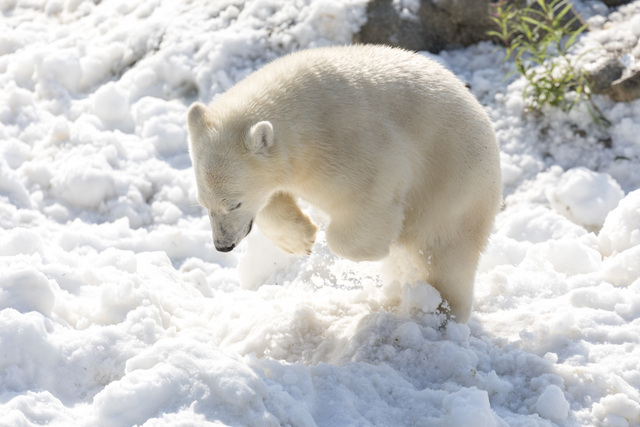 It’s wonderful to see you playing so happily again in the white stuff! . . . What a great idea this was of those children. . . I’m shure you did or you will show them your broadest smile when you saw/will see them at your enclosure’s fence . . . To have snow even it’s hot-hot-hot outside (as TEDDYBAERENMUTTI and your godmother MERVI did tell us) is kind of a miracle, isn’t it!? Thank you for your good wishes! May be we’ll need them soon again. In this crazy world you never know what the next day will offer as a surprise. Lucily there are still also positive surprises! Au ja, Du hast Recht! how wonderful you can play in snow also now in July, What a good idea and a phantastic donation I can see how much joy you and Mama have with this big snow. It is really like in Schlaraffenland, some disire become true. I wish you and your Mama and also your Daddy much fun. Thank you so much for this wonderful pictures. die Schneeladung mitten im Sommer war eine tolle Überraschung für die drei in Rauna. Im Video sieht man besonders gut, wie er Venus und Nalle gleich zu neuen Spielen anregt. Schneelieferung und der Papa hatte die entsprechenden Verbindungen dafür. Danke dir und Marco für die herrlichen Winterbilder im Sommer! Dear Mervi, this is just wonderful. 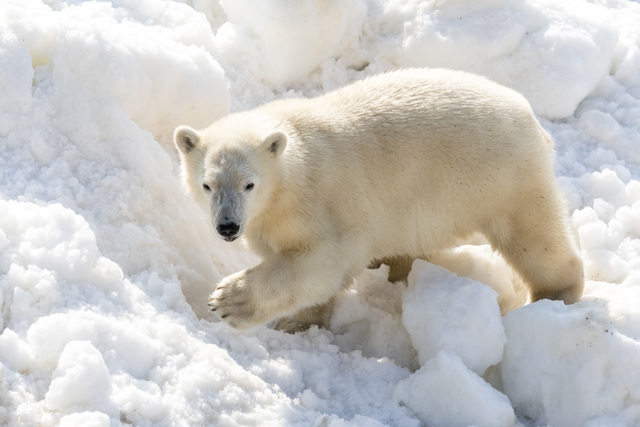 Seeing the joy of the polar bears having snow again and frolicking around in it demonstrates how much the snow, ice and the Artic world is their natural habitat. Living with 26°C must be hell for them!!! And for us humans, it is actually a perfect temperature. Nalle is apparently having a very good time, just like his mommy. 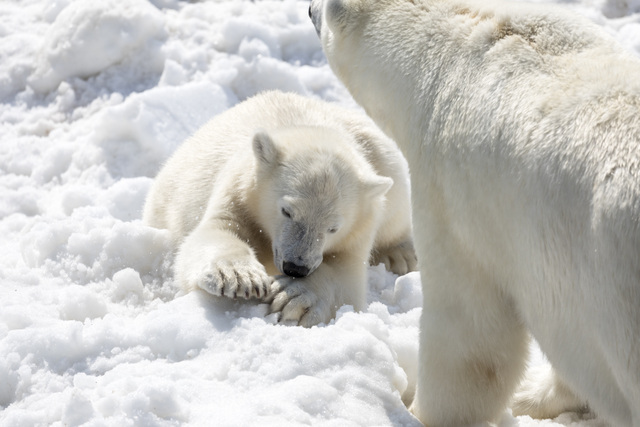 And it is soo funny to see how they start to play together in the snow immediately. in Berlin after a warm day here. in the magical white present. Terve taas, dear Mervi and Nalle! Snow fields look so much better than the flooded fields there are in special parts of Germany. 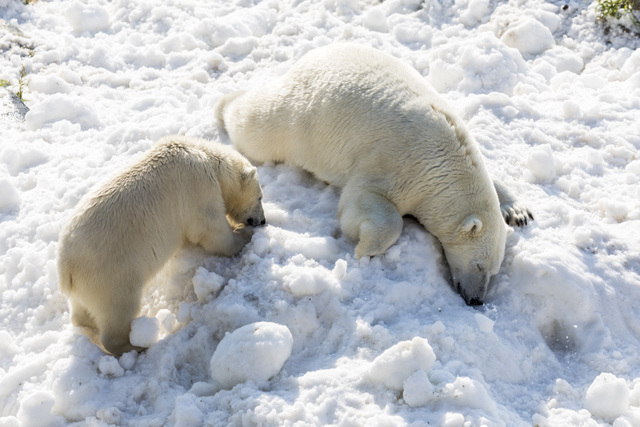 I’m so happy to see the Ranua bears enjoying themselves in their gorgeous snow beds. Thank you, dear Marko and Mervi for sharing this winter special in July! 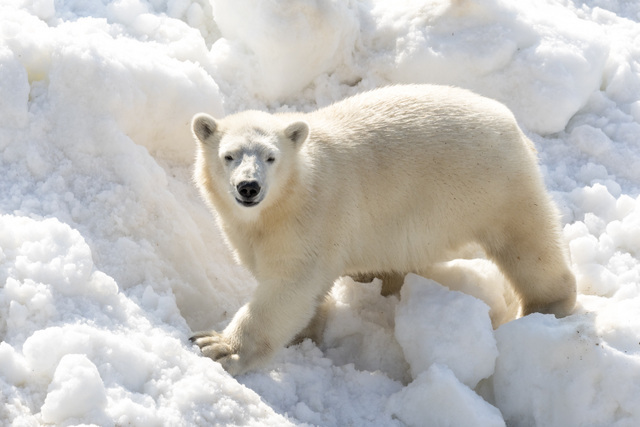 das ist natürlich das Beste für Eisbären, Schnee im Sommer und das war richtig viel Schnee. Kinder denken geradlinig und so logisch und es ist toll, das das so umgesetzt wurde. Vielen Dank, schöne Bilder von glücklichen Eisbären. Log in | 53 queries. 0.833 seconds.